Material: Alloy steel with minimum tensil strength of 180,000psi. Design Factor: Safety Factor: 5:1, Magnetic Particle Inspected Per ASTM 1444. 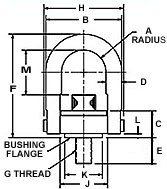 Hoist Rings retain the same rated load from 0 to 90 degrees from the bolt axis. Typical Applications: ADB, the originator and leader in safety hoist rings, introduces another time and money saving innovation. ADB's new EZ-Torque® Hoist Ring eliminates the need of locating and installing hydraulic torque multipliers for large hoist ring installations. A 75,000 lb. 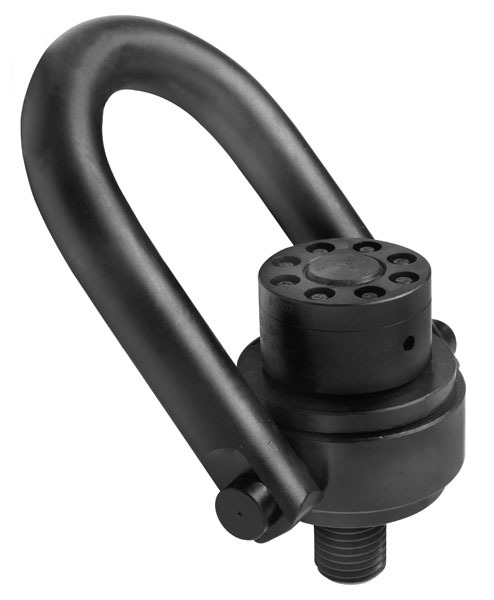 rated load hoist ring requires the mounting screw to be torqued to 4,300 ft.lbs. Using ADB's EZ-Torque® Hoist Ring requires only a standard torque wrench and 92 ft.lbs. of torque per bolt! * Also available in a wide range of plating - e.g Cadmium, Titanium-Cadmium, Nickel, etc. All dimensions approximate â€“ variations do not effect use or design factor. † Exception to standard discounts. For individual product weight, please contact us.